Using inshaves to cut troughs. I have been cutting some troughs that I shaped roughly this fall and put to dry. 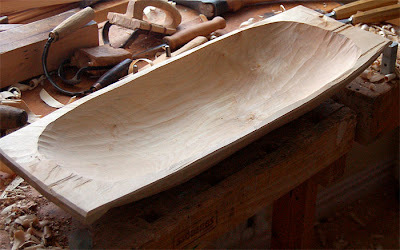 I am making a trough that will be used to wash butter in, so I wanted to make a real big trough. My favorite tool for cutting the inside of troughs is different types of inshaves. I also use gouges, for example Pfeill, but to a small degree. The disadvantage of using inshaves instead of gouges is that you can not use your bodyweight when you cut, because you don´t use the tool to cut away from you. But when you get over that discouragement, they are a joy to work with thanks to the long edge you get. It quickly cuts a surface with fine broad facets without getting any scratches, like you easily get by using a flat gouge. The inshaves I use are both new blades from Svante Djärv and Hans Karlsson and older tools that I bought at flea markets and eBay. 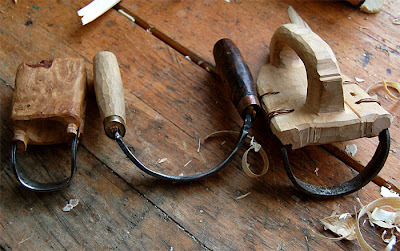 To the left is a blade made by Svante Djärv and next to that two old tools that I had to make new handles for.